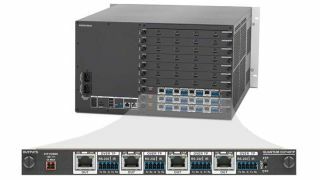 The What: Extron Electronics has introduced the new Quantum OUT4DTP, a four-channel DTP output card for the Quantum Ultra video wall processor. The Quantum OUT4DTP card sends video signals up to 330 feet (100 meters) over shielded Cat-x cable. The What Else: In four-channel mode the unit supports resolutions up to 2K. Dual-channel mode supports two single-path 4K/30 signals, while single-channel mode supports one dual-path or quad-path 4K/60 signal. Output format selection provides a choice of DTP, XTP, or HDBaseT output modes. Power insertion on the Quantum OUT4DTP enables remote powering of DTP receivers, eliminating the need for separate power supplies at the remote units. Bidirectional RS-232 and IR insertion provides control of AV devices by transmitting data alongside the video signal over DTP connections, allowing the remote device to be controlled without the need for additional cabling. "Our customers have incorporated the Quantum Ultra into a variety of unique and creative applications because its performance and reliability are unmatched by any other video wall processor in the industry," said Casey Hall, vice president of worldwide sales and marketing for Extron. "The addition of the new four-channel DTP output card expands the possibilities for video wall system design even further." The Bottom Line: Quantum Ultra is a modular 4K video wall processor with high-performance scaling and windowing technology that accommodates a wide range of applications. It features the Extron Vector 4K scaling engine and HyperLane video bus capable of carrying a multitude of high-resolution sources for unmatched real-time performance. A single processor can support multiple video walls with mixed resolutions and screen orientations, providing flexible system design with minimal complexity and cost. Portrait and landscape output support, output overlap, and mullion compensation provide compatibility with nearly any display technology. RS-232 and Ethernet interfaces provide direct connections for control systems.